“Only a crisis, real or perceived, produces real change” stated Milton Friedman, economist and vanguard of the free market and indeed the free market has prospered through human suffering. Friedman is a classic Conservative who believed that if one suffered, tough, one was dealt a poor lot, it is not upto society to fix the situation. According to Naomi Klein and Alfonso Cuaron there is hope for the disenfranchised even during the rule of the free market. Hope is knowledge and communication (the basis of Enlightenment ideals – classical Liberalism) – “to resist shock is to know what is happening to you and why”. I’ve tried to believe this for a long time, but when I read of what is happening in our world and to consider the parallels of how it has happened before even within my liftime (and I’m not old), it’s difficult to believe in information as shock resistance. And hell, I’m a firm believer in informationalism, but one must have some level of entitlement, whether by birth, geographic location, migration, or availability of information. To say that information is resistance, assumes a great deal and only one that is entitled would be so careless to make that declaration. Perhaps the liberal revolution has lost to a powerful deity, one that was always with us, human nature – lust, gluttony, greed, sloth, wrath, envy, pride… the engines of Western civilization. Following my opening at Vox Populi on Friday, one person commented that sequences of my animation reminded her of the animations of Harry Smith. Not being familiar with Harry Smith, I searched for his work and discovered the animation above on YouTube, where several others are available. Although technically I appreciate Smith’s strictly geometric abstractions, I’m much more drawn to this particular animation that presents figurative characters set against the geometric lights and shapes. It seems that his interest in anthropology presented Smith with a wide array of characters to draw from such as Buddhist deities. Considering the animation tools of the period, Smith’s films are inspiring in so far as the work of one man who was also a folk music archavist, sound artist and mystic. 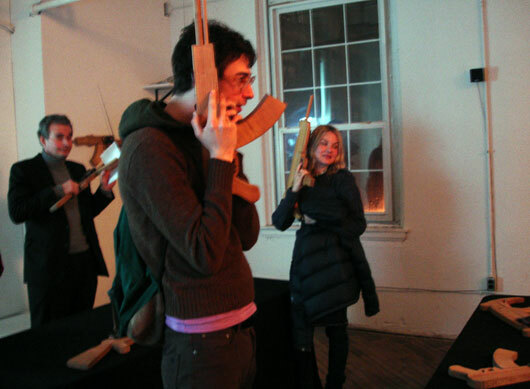 My installation “On Transmitting Ideology” opened this past Friday at the artist run, Philadelphia gallery Vox Populi. 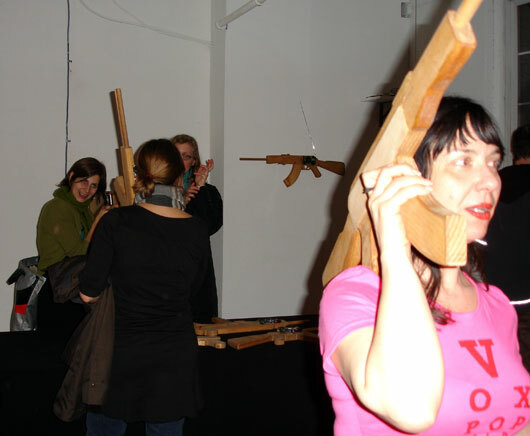 The installation presents eleven wooden guns outfitted with radios broadcasting declarations on freedom and transformation in our society. As I was listening to famous historical speeches concerning U.S. politics, I primarily became interested in the rhetoric that has established “Conservative” vs. “Liberal” ideology in the United States. Unfortunately due to the quality of sound of early 20th century speeches such as an excellent speech by Calvin Coolidge declaring the need for an imperial reach by the United States in the name of liberty, I narrowed the selection to speeches since the second half of the 20th century. The broadcast is 18 minutes long and begins with the famous declaration by Barry Goldwater “I would remind you that extremism in the defense of liberty is no vice and let me remind you also that moderation in the pursuit of justice is no virtue.” The broadcast includes an excerpt from a debate between Buckley and Chomsky, and excerpts from speeches by Reagan, Martin Luther King, and Obama. For the most part I left the excerpts intact; it is only with King’s speech in opposition to the Vietnam War that I withdrew “Vietnam”, because his arguments against our intervention in Vietnam parallel all to well the current war in Iraq. Pictured above, in the upper right corner of the gallery on a shelf sit a CD player connected to a miniFM transmitter. 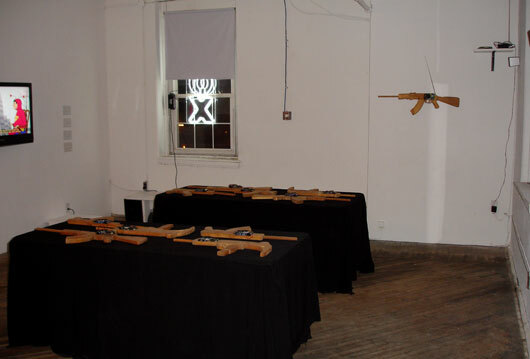 On each table are five hand-crafted wooden AK47s and Uzis (one is also mounted on the wall), each gun has an exposed pocket radio tuned to the transmitter. The exhibition also features two recent video commissions that question the outcome of popular notions of freedom, liberty and the power of capital. “Arbol que nace torcido, nunca su rama enderece” (“Tree that is born twisted will never straighten”) is an animation created for the public commission “Carreta Nagua, Siglo 21” (2007) that tells a tale of immigration, aging and cultural and familial loss. Two aging television super heroes, Ultraman and El Chapulin Colorado take the voices of my parents as they look back upon their lives and consider the price of immigration. 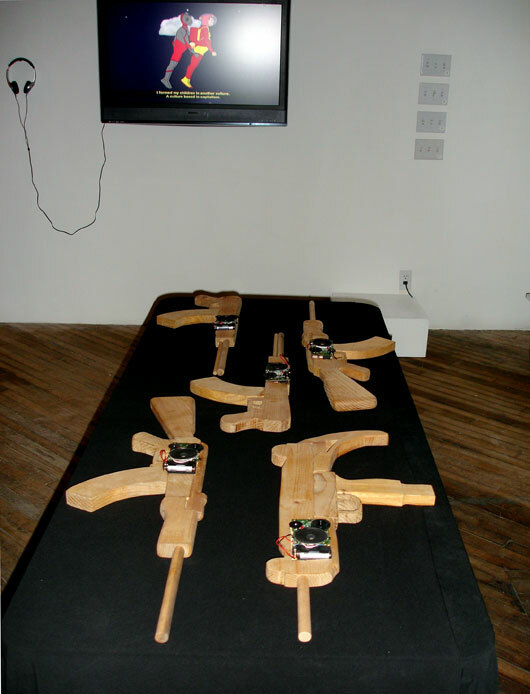 The video “El Rito Apasionado” (2007) (commissioned for 50,000 Beds) takes place in a hotel room where three Guevarrian Neo-Marxist Latino Terror Revolutionaries from Cuba, Nicaragua and Mexico gather to prepare an act against the history of U.S. intervention.